This metaphysical riddle challenges our ideas about reality and perception and whether or not our knowledge of how something works exists in an unperceived existence. It is also viewed as a technical question: without ears present to hear a sound wave, how can it be heard? For all the things collected in archives, it is common to not have the exact item a person is looking for. This is sometimes due to the fact that it is lost or destroyed while at other times it is a result of having likely never existed in the first place. In these situations the researcher is more often than not challenged with the metaphysical task of pairing known reality with perception of existence. The task is to take the documents that do exist and seeing whether or not they support a proposed theory. It is the metaphysical equivalent of the tree falling in the forest riddle: If a decision is made, and there is no record in the archives, can it be documented? A recent research question dealt with such a gap in documentation. 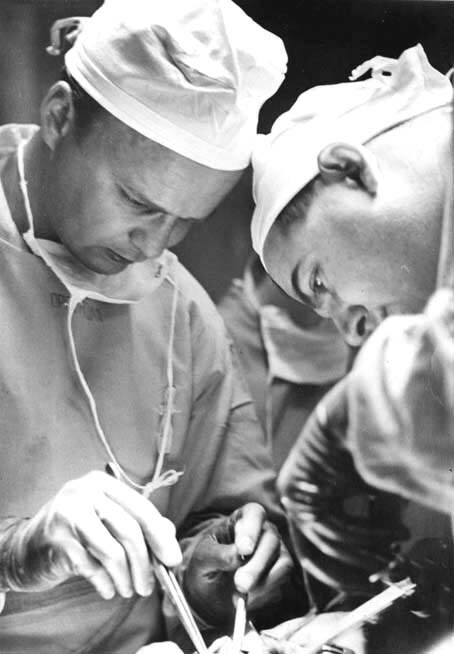 The topic seemed straight forward: When was the first medical ethics course taught in the Medical School? Every clue moved the researcher further back into time with less and less solid documentation. Working backward from the 1980s, the researcher discovered bits and pieces of evidence that further shaped an undocumented reality. Student advocates, departmental politics, and curriculum planning all lead to the late 1960s and focused squarely on the origins of the Department of Family Practice. Definitive documents defining the development of the course or its justification were never found, but the archives provided historical mile markers and contextual evidence for the researcher to elaborate on this unperceived existence. 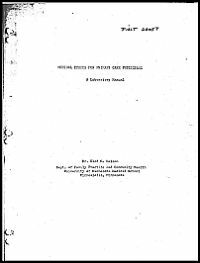 One document found along the way was an incomplete, undated copy of a medical ethics laboratory manual written by Elof Nelson, a chaplain at Fairview Hospital and the course instructor in the 1970s. Only the first 45 pages of the approximately 200 page manual are available. The remaining likely exists but is not yet preserved in the archives. The manual describes medical ethics as “search and tentative discovery [rather] than indoctrination.” The same can be said about historical research. Read the partial lab manual below. It includes the full table of contents so in this case we know what we are missing. The teaching of geology often starts with an introduction to the geologic time scale as a means to acquaint students with the concept of deep time and how to better comprehend eons, eras & epochs. Although littered with catastrophic events such as meteorite impacts, volcanic eruptions, and earthquakes, the surface of the earth and the life forms it has supported have been most profoundly changed by the incremental affects of water, plate tectonics, and photosynthesis over the course of 4.5 billion years. So, do archives have a deep time? Occasionally, the events that bring records to the archives are cataclysmic: the death of an individual, the closing of an organization, or even a natural disaster. These same catastrophes all too frequently tilt toward the utter destruction of the materials and remove them entirely from the record. But more commonly, records trickle in like water, move slowly from one place to another, and even proliferate through technological photogenic processes such as the photocopier and scanner. These deep time thoughts, so to speak, came to me last week as I looked over a recently acquired collection of correspondence. The letters are to and from Hal Downey (1877-1959), a world-renowned hematologist who spent the majority of his life studying, teaching, and researching at the University of Minnesota. The collection is largely exchanges between Downey and his colleagues in the U.S. and Europe before World War I through the late 1950s. Most notable are a series of letters related to Dr. A. Maximov, a Russian hematologist looking to escape the restrictive conditions of early Soviet Russia. Downey eventually helped Maximov secure a position at the University of Chicago. However, it was actually a pair of letters that set my thoughts in motion. 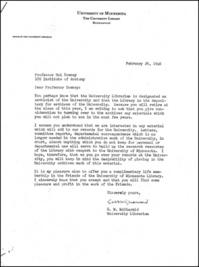 The first was a letter from E. W. McDiarmid the University Librarian dated February 26, 1946 on the occasion of Downey’s retirement. In his letter McDiarmid requested that Downey consider turning over to the archives any material he will no longer need in his retirement. He specifically asked for letters, committee reports, and departmental correspondence that may be in his possession. Downey responded that “it is not likely that I have anything of importance” and that he hoped to remain in his lab space for years to come. He would remember the archives if anything seemed of value. Sixty-three years later, Hal Downey’s daughter and two granddaughters deposited his valuable correspondence in the archives. The material joined a small collection of Downey’s manuscripts that were donated by his wife Iva shortly after his death in 1959. It was a lifetime between McDiarmid’s request and the actual deposit. 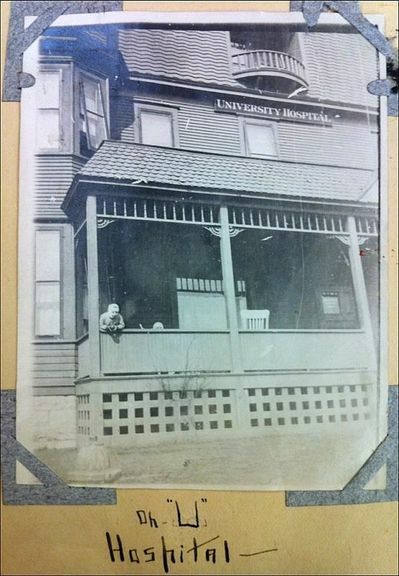 It was a fraction of the University’s history. It was a blip on the geologic time scale. If we are students of the earth then we realize that none of us are permanent residents of this planet, nor are our institutions. Yet, to invoke Hutton, archives exist because we see “no vestige of a beginning, no prospect of an end.” So, we create, document, preserve, and then begin again. Read the letters between McDiarmid and Downey below. 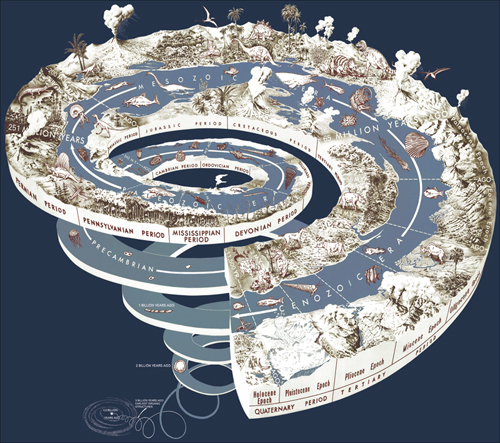 Image Credit: A diagram of the geological time scale available from the US Geologic Survey. Source image available from the Wikimedia Commons. Archives are often described as organic in nature and the material within the collections as containing organic-like relationships that archivists strive to preserve and to promote. The organic metaphor fits nicely with the life-cycle model for records and records management: organic/inorganic; active/inactive; living/dead. Management of electronic records and digital surrogates is casting a new light on an old problem with the organic/life-cycle metaphor: When does an active document become a record? Furthermore, does our own desire/ability to provide stewardship for a record determine whether or not it will become a part of the archival process? Are records outside of our traditional management process of less importance? The organic/life-cycle model works best when there are clear beginnings and endings. It seeks to establish the birth, life, and death of a record at which point it becomes archival. Many Australian archivists and some of their counterparts in Canada are promoting a continuum model to replace the life-cycle approach to records management. The records continuum model changes the organic metaphor from birth/death to ecological in its application. The information’s survival is not dependent upon our stewardship; instead, its use relies on the archivist’s ability to contextualize the information and manage it as a time/space object. The archivist’s job becomes less of a mission to preserve the information landscape and more of an undertaking to make ecological connections for our users and constituents. To understand its practical application, a recent post by Lorcan Dempsey highlights the problem with life-cycle stewardship. Research, data, learning objects, and institutional records are less stewarded than other traditional material like books, serials, newspapers, and manuscripts. By creating better points of contact to these former materials that are intricately bound to the latter, Dempsey sees the potential for new unique resources previously out of reach for both the researcher and information professional. It emphasizes the continuing use of information, not its product. Dempsey uses the University of Minnesota Digital Conservancy, an institutional repository, as an example of tool designed to provide context and access to information that does not fall neatly into a life-cycle model. This will also become more of a method to document and provide access to material that is part of the AHC History Project. Obesity and the archival record, or, do these records make me look fat? Several news outlets have reported on a new finding published in the New England Journal of Medicine (vol. 357, no. 4, July 26, 2007) regarding the spread of obesity in social groups. The article, “The Spread of Obesity in a Large Social Network over 32 Years,” was written by Nicholas Christakis, MD, PhD, and James Fowler, PhD. Their findings detailed the increased chances of an individual becoming obese if 1. a close friend became obese (57% increase); 2. an adult sibling became obese (40% increase); or, 3. a spouse became obese (37% increase). They also found that persons of the same gender also increased the chances of one obese person influencing another. 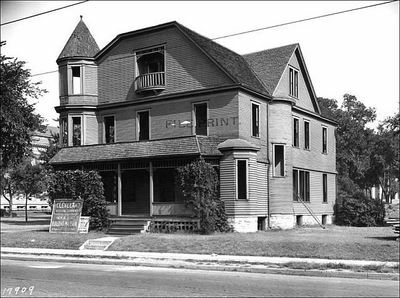 The data set used for the study comes from material collected for the Framingham Heart Study that began in 1948. A second cohort of the offspring of the first FHS was established in 1971 and a third cohort of offspring of the second generation began in 2002. The obesity study used only data from 5124 individuals in the second FHS cohort (1971). It tracked the social networks of the people by creating a database of information taken from handwritten administrative tracking sheets used to facilitate follow-ups with each participant. The tracking sheets included family names, relationships, addresses, and at least one close friend as a contact. This social information was not the basis for the Framingham study, but merely an administrative tool to be able to contact someone for their next appointment. The net result was 38,611 observable social networks among the participants. This study demonstrates two interesting points in regards to archives. First, data collected for one reason can be creatively repurposed at a later time for another reason. This is one of the simplest arguments for retaining records in archives. Records are not kept merely to recreate the transactional nature of institutions and their activities, but instead provide for the use of information for other intentions. The second point is the fragility of data. The information used to gather the findings was part of a three generation (and counting) study of heart disease. It was available because it was part of an active project that was well-documented. Due to the size of the FHS and its findings, it is likely that the data sets produced will be well-maintained after its conclusion at the National Library of Medicine or elsewhere. However, other data sets with the same potential to be repurposed into new studies are not always as lucky. And, it is likely it will become more precarious for them in the near future. Issues concerning the privacy of patient and human subject information are part of the archival management process. The Privacy Rule regulations under HIPAA have done little to address the long-term preservation of PHI materials in archives. It is much easier for principle investigators, institutions, and archives to simply destroy the data as a sweeping act of safeguarding. True, there are few alternatives under the current regulations, but it comes at a cost of re-useable information and perhaps at the cost of our own health and well-being. Occasionally, it happens that the faculty papers or departmental records I make appointments to review are not the faculty member’s papers or the office’s records at all. Instead they are carefully crafted research collections or the archives of a professional society or another institution. These collections within collections are often the result of a group or organization being unable to care for its records and as a substitute they are turned over to a well-meaning faculty member or administrator. 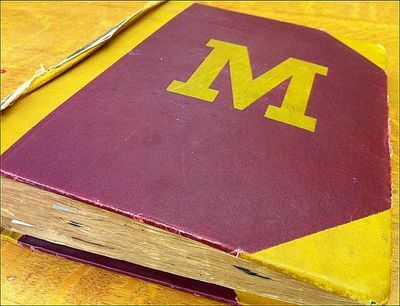 Once that person retires or moves on to a different university, the records are left behind at an institution where there is no administrative connection and a dwindling provenance to their origin. These materials can be just a few folders at the end of a box. They can also be multiple filing cabinets that could produce 18-20 linear feet of material. It is easy to state that these materials fall outside the collecting scope for the project. However, the potential for loss becomes greater as fewer and fewer options become available for their long term storage and management. It highlights the utilitarian versus preservationist ethical dilemma in archival work. 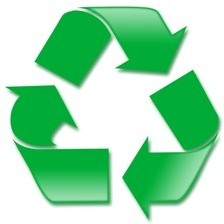 We preserve what we can, hopefully, in a sustainable method.